Pumpernickel is a type of very heavy, slightly sweet rye bread traditionally made with coarsely ground rye. It is now often made with a combination of rye flour and whole rye berries. It has been long associated with the Westphalia region of Germany. Left: A slice of German-style pumpernickel. The first written mention of the black bread of Westphalia was in 1450. The defining characteristics of Westphalian pumpernickel are coarse rye flour—rye meal—and an exceedingly long baking period. The long slow baking is what gives pumpernickel its characteristic dark color. The bread can emerge from the oven deep brown, even black. Like most all-rye breads, pumpernickel is traditionally made with a sourdough starter; the acid preserves the bread structure by counteracting the highly active rye amylases. That method is sometimes augmented or replaced in commercial baking by adding citric acid or lactic acid along with commercial yeast. Loaves produced in this manner require 16 to 24 hours of baking in a low temperature (about 250°F or 120°C) steam-filled oven. The bread is usually baked in long narrow pans that include a lid. Like the French Pain de mie Westphalian pumpernickel has little or no crust. True German pumpernickel is produced primarily in Germany, though versions of it are sometimes made by specialty bakers outside its homeland. 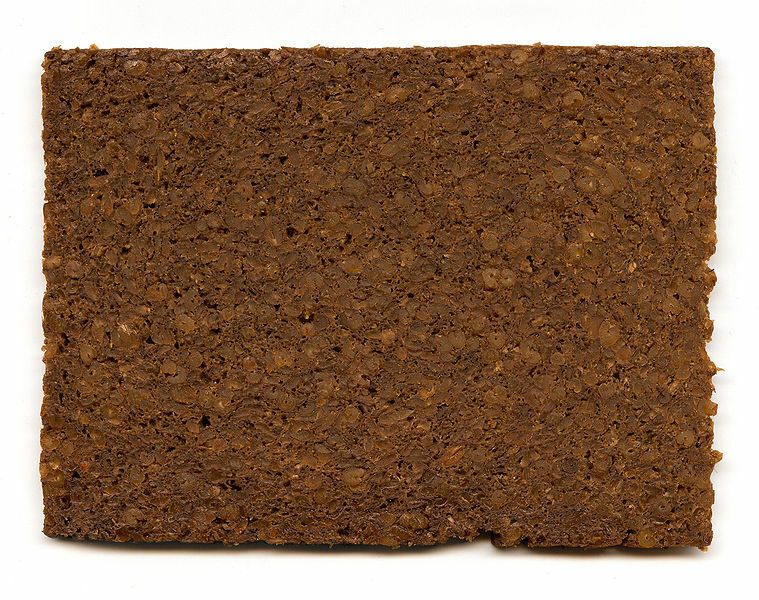 German pumpernickel is often sold in small packets of pre-sliced bread. It is usually found in markets aimed at an upscale clientele because German pumpernickel is often paired with caviar, smoked salmon, sturgeon, and other expensive products of the hors d'oeuvres tray. Broadly speaking, there are two different pumpernickel traditions -- the Westphalian pumpernickel, made almost completely from rye and a sourdough starter, and the American Jewish tradition, in which the bread is closer to a basic American rye bread with rye flour for flavor and wheat flour for structure. The Philologist Johann Christoph Adelung states about the Germanic origin of the word pumpernickel. In the vernacular, Pumpen was a New High German synonym for being flatulent, a word similar in meaning to the English "fart", and "Nickel" was a form of the name Nicholas, an appellation commonly associated with a goblin or devil (e.g., "Old Nick", a familiar name for Satan), or more generally for a malevolent spirit or demon. Hence, pumpernickel is described as the "devil's fart", a definition accepted by the Merriam-Webster Dictionary.